What's the Best Natural Running Shoe? I must admit, today's a pretty exciting day. It's the first time in over a year we'll be getting in new "natural" footwear to test for our readers. Though we're not big fans of most footwear, it always feels like Christmas when new shoes start coming in. Today I believe we'll get in the Topos, or the minimalist shoes envisioned by Tony Post, former CEO of Vibram, who (along with Born to Run and Barefoot Ted) helped spearhead FiveFingers. Our goal: We want to test anything out there that will help runners keep their natural form, while giving protection to the foot. Ultimately, that's what we see footwear as, protection for our soles. That's what it was for Native Americans, who started using hides to protect their skin from sharp cactus and other dangerous obstacles. And that's what it still is for the Tarahumara, who use strapped on retreaded tires to make the most bomber, unsupportive sandals they can; so they can run over some truly rugged and rocky terrain. Indigenous people haven't made sandals and moccasins for thousands of years to "support" their foot, or give it "motion control" or give the heel more "cushioning" to protect their knees, they just wanted to protect their skin and allow the feet to move lightly, freely, and fast. So we'll be testing every "natural" footwear out there, trying to get beyond the hype, beyond the claims, and beyond the marketing machines to see what really works. And we'd love your input, what do you like, what do you want to see us test, and what have you found hiding out there, as the most innovative shoes, often come from the little guys, before they make it big. What are your favorites, and what would you like to see us test? We'll be looking at some key footwear criteria, in essence, to try and determine how naturally they allow us to stride. Language is interesting, and in particular when it comes to the shoe. I've never liked the term "minimalist" as what does that really mean? I often joke, a tank's pretty minimalist compared to a battleship, but not compared to a honda...with the dozens of "minimalist" shoes out there, the term got watered down and became pretty meaningless. And then Vibram got sued, and now NO ONE wants to use the minimalist label. Instead they've switched to "natural" footwear...ironic, since there really is no such thing. But, I like the label better, because to me, it's about which shoes allow you the most natural form. Now whether these shoes live up to their new label or not...I'm suspect, but we're going to find out. In general, when looking for footwear that allows the foot to move more naturally, we're looking for the most "moccasin-like" footwear we can find. Footwear that doesn't encumber the foot, that keeps us close to the ground, that allows the foot to flex, and bend, and feel...to roll, to pivot, to spring, and to fly. This means no heavy toe spring, or curl up in the front. It means no high heels...ever seen those on a moccasin? It means no clunky sole that doesn't flex much more than a brick. And it means NO arch support. The arch is our sacred spring, and one of the greatest designs in nature. It's what protects our foot and our entire body. Lock out the spring, and you're jamming force upwards, EVERYWHERE. So the search is on, it'll be exciting to see what we find. In an age of "maximalism" where marketing has swung the pendulum 180 degrees from more natural footwear, it'll be interesting to see what's out there. Our goal, to inform you, our reader and viewer, and to help you find the best footwear to support the most natural stride possible. Of course, it'd be great if we could be barefoot all of the time. But in the city, or on sharp lava, in the winter, or when we're racing and want to go fast, that's just not always possible. So we'll do what we can to help you make the most of your adventure, by finding you the best footwear to help you fly like the wind, dance on the trails, and do your best to run free! Photo - 3D printer concept design by http://pensardevelopment.com/projects/dna-shoe-concept/. 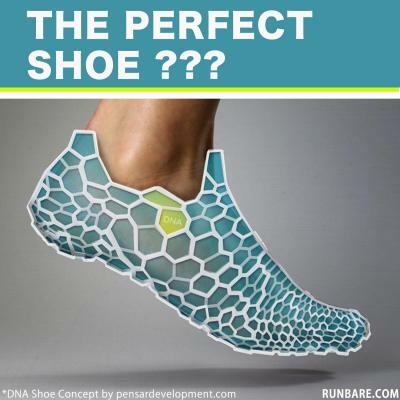 The idea, wear a shoe with sensors for a test-run, then come back to the shop, and have them print out the "perfect" (in theory) custom shoes. Of course, it'll all depend on the paradigm they're operating under. Breathe Easy On Your Runs!